Exploring Human Origins: What Does It Mean To Be Human? explores the wonder of the scientific discoveries concerning human evolution and how these findings connect to diverse personal and societal perspectives. The exhibit also assesses who we are as a species and why it matters. The main purpose is to provide opportunities to further engage a national dialogue through community conversations on the life sciences. 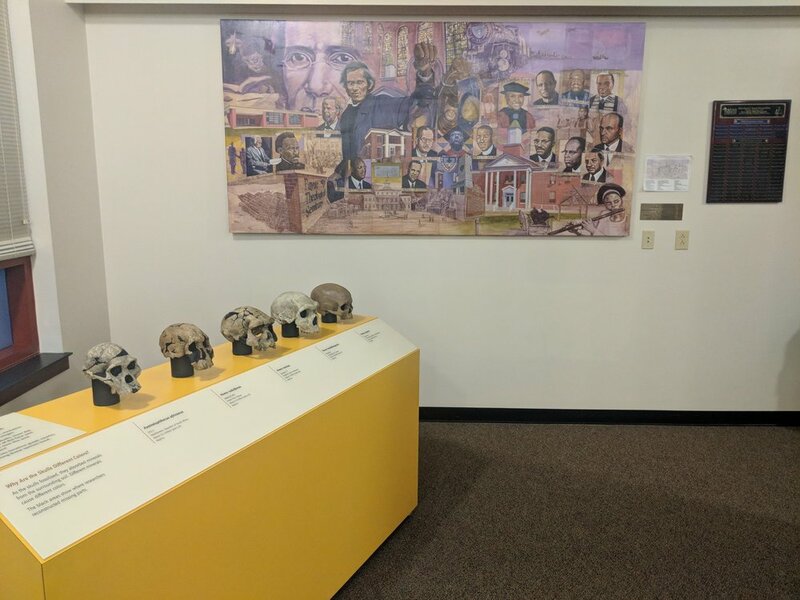 The dialogue builds opportunities for audiences to connect their personal lives and viewpoints with the scientific exploration of human origins. The exhibit begins with an invitation to visitors to record their thoughts & ideas on a display panel and at a computer kiosk, which is registered in the Smithsonian’s website archive of answers received online and in the exhibition, available for all to see. Earth’s climate has fluctuated between warm and cool, moist and dry. Climate fluctuations posed hardships to early humans seeking food, shelter, and other resources. Any new traits that helped meet these basic needs increased our ancestor’s chances of survival. Notice how walking upright, making tools, eating new foods, brain enlargement, new technologies, shifts in social life, and early symbolic artifacts emerged over a 6-million-year period of increasing fluctuation in environment. Our species, Homo sapiens, evolved during the most dramatic fluctuations of all. How do we know climates changed? This panel introduces the rich mosaic of physical features and behaviors that distinguish humans as a species from all other organisms. As early humans evolved, four major groups emerged. Each group includes several distinct branches, or species. For much of the 6 million years of human evolution, more than one species lived on Earth. Over time, most of these species became extinct. Our own species, Homo sapiens, is the lone survivor. How do we know the age of fossils? Visitors select from a menu of three activities: (1) Compare modern humans with early humans. (2) How to tell one species from another. (3) Compare evolutionary trees. Due to billions of years of evolution, humans share genes with all living organisms. The percentage of genes, or DNA, that organisms share records their similarities. We share more genes with organisms that are more closely related to us – those species are called primates. How do we know humans are primates? Besides similar anatomy and behavior, there is DNA evidence. It confirms that humans are primates and that the distinct ancestors of humans and chimpanzees diverged from a common ancestor between 8 and 6 million years ago. There is only about a 1.2 percent genetic difference between modern humans and chimpanzees throughout much of their genetic code. This 3.2-million-year-old skeleton from Ethiopia, nicknamed Lucy, shows the combination of apelike and humanlike features that enabled her species to climb trees and also walk on the ground. This flexibility enabled her species to survive in a variety of environments. Replica trail of early human footprints made in East Africa about 3.6 million years ago. Their size and shape provide unmistakable evidence of walking upright.